Like it. Love it. Buying it. I’m taking a deviation from the norm with this week’s LLB by throwing in a bit of decor. As I’ve mentioned, I’ve just moved into a new apartment, that I will incidentally be leaving in six months, so I’ve got interior design on the brain. Like anyone who’s settling in to a new home, my mind is overloaded with new, fun ways to decorate. However, I have to hold myself back from any major furniture or decor purchases considering I have no idea what my new home will look like in six months. So, I’ve limited my scope to decorative storage items, lamps and other small-scale tchotchkes. I’ve wanted to redecorate our bedroom for almost a year now, so I thought I’d start by buying some new through pillows, rearranging and re-using some of the furniture we already have and buying some new table lamps. 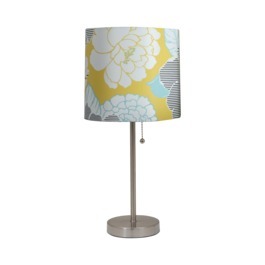 Of course, I decided this without realizing just how expensive lamps can be! I thought I’d share a few of the styles I’m digging – and the budget option that I am ultimately going with. This is the little lamp that could. With a minimalist shape and a fun pattern to add some punch, it is a wonderful wallet-friendly option. Yellow and teal is one of my favorite color combinations and the black stripes help keep it from looking too youthful. 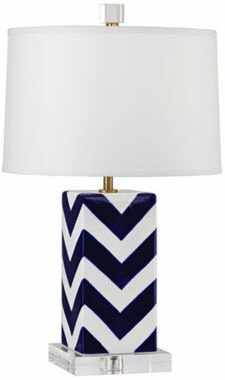 I’m a sucker for anything chevron. A pair of these lamps flocking the bed would be gorgeous. However, I don’t have $400 to throw around, so while I pledge my undying love (insert I love lamp joke here), I knew I needed to look for another option. 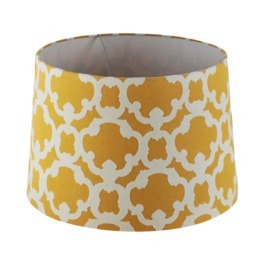 The bold pattern of this shade is exactly what I’ve been looking for and is a fraction of the price. I purchased two from Target’s website and am planning on visiting a local store to pick up some bases on the cheap. All in all, I’m hoping to keep the total to less than $100, making a big impact with a little budget. My usual go-to for home decor is Homegoods, but I wasn’t fond of the lamp selection when I took a trip there this weekend. I was, however, able to stock up on a great chevron rug, some assorted storage baskets and small accessories. What is your favorite home store?